We have all seen their mysterious black figures soar across the sky and heard their loud “caws” from near and far. But have you ever thought about why crows seem to be everywhere in North America? These birds belong to the Corvid family, known as some of the smartest birds in the world. Corvids include crows, parrots, jays, rooks, ravens, and (a rather common bird around our valley) magpies. With large brains and the ability to work together, crows in particular have been studied and admired for their intelligence and ubiquitous nature. There are 40 species of crow and they are found nearly worldwide. 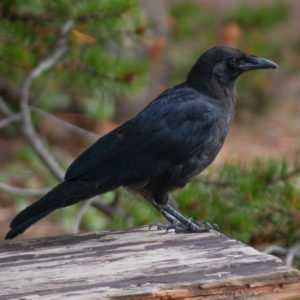 The species we see most around the valley is the American Crow. Why are they so successful? Certainly it has to do with their incredible ability to problem solve—for example a group of crows figured out how to filter food from sand by using mesh wiring. We also have to credit their high level of understanding of the natural world around them—crows will participate in “anting” themselves by allowing ants to collect in their feathers in order to ward off unwanted parasites. But we also have to acknowledge their outstanding ability to work together as a team. Crows, and many other Corvids, are very social birds. This is why we hear so much cawing when we see a group of crows—they communicate with one another constantly in order to optimize survival. If you ever get a chance to witness a crow “funeral” you’ll see firsthand some of their unique social habits. During these events, up to 40 crows will gather together around the deceased, cawing loudly. They do this, some researchers argue, to understand how the bird died and how to prevent more deaths in the future. As vocal as these critters can be, crows are significantly much quieter around their nests in an effort to stay hidden. Crows will typically stay within the same area where they were born. This is because they grow up memorizing their surroundings and also because they work together to survive with their families. Crow pairs will typically mate for life and along with their offspring make a collective effort to raise newborns. After about two years, a pair’s offspring will go to start their own families –but may still roost with their parents. The crow’s value of community plays a huge part in their success as a species. They learn and will teach each other good cache hiding spots, areas with plentiful food, and what other animals are threats and how to ward them off. Surprisingly, crows can even recognize the faces of people that have wronged them. Researchers found that, when they wore human-like masks and disrupted a group of crows and they later came back wearing the same mask without posing a threat, the crows would mob them. Researchers then found that the group of crows that were threatened would also teach other nearby groups about the enemy. This was not only taught but remembered—researchers found that, after nearly 5 years, if an individual wearing the original threatening mask approached the same group, they would be mobbed. Just like we learn and teach certain things for our own survival, like looking both ways when crossing the street, crows apparently do the same in their own unique quest for survival! Tessa Cafritz is a naturalist at Walking Mountains Science Center. Since she started working there last summer, she has become fascinated with the local corvids. From the Stellar’s Jay to the humble Black-Billed Magpie, Tessa has enjoyed observing and learning about the valley’s intelligent and admirable bird species.